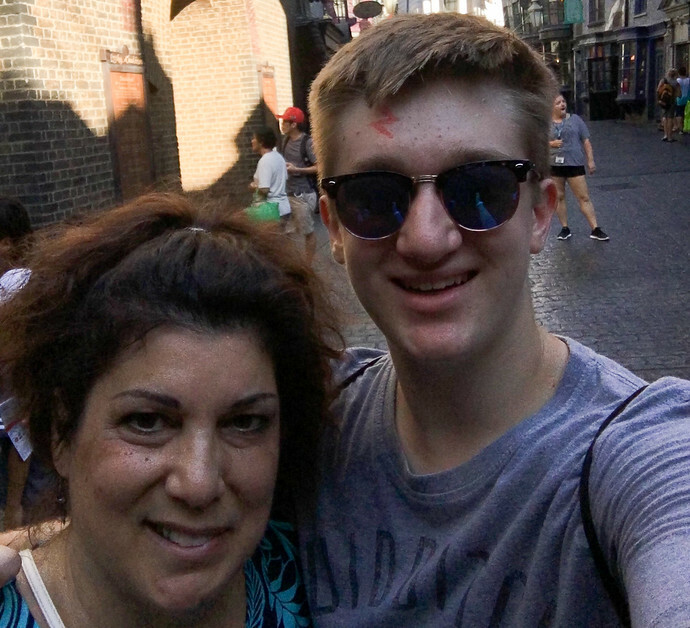 This is a guest post by 16 year old writer and #1 Potterhead Brian Selcik, a student at the Metropolitan School of the Arts. Brian has previously been a guest here before, writing how you can plan your very own Harry Potter tour in London. He’s visited the Wizarding World of Harry Potter at Universal Orlando 4 times and shares what he’s learned from experience to make your trip there even more magical. The Wizarding World of Harry Potter (we’ll call it Harry Potter World) is one of the most magical experiences for fans of all levels. Whether you’re simply a movie watcher (I’ll try to forgive you) or a super fan like me, everyone will enjoy the magic that Universal has to offer. As amazing as it is, there are some things you should know before visiting Harry Potter World. If you’re staying at any of the Universal Orlando on-site hotels, you almost certainly have early admission to Harry Potter World included with your accommodation. This lets you get into the park an hour (sometimes two) earlier than everyone else. I would recommend doing Gringotts because that line probably reaches the longest wait time out of all the Harry Potter rides. After you’ve experienced the full queue, you can just hop in the single rider line from there on out. Single rider lines are available for the Harry Potter and the Escape from Gringotts and the Forbidden Journey rides. Essentially, single rider lines offer a shorter wait time since they’re used to fill in people-gaps on the rides, but you won’t be sitting with your party. For instance, if there’s a party of three going on the Forbidden Journey, they’ll fill in the fourth seat with a single rider. One thing to note: you won’t be able to experience the full queue (there are surprises along the way) with single rider lines, so if you can get that experience in the morning, it’s worth it. If you plan to buy merchandise, bring money. Lots of it. All the galleons, sickles, and knuts that will fit into your bag… or you can transfer your muggle money into Gringotts bank notes at the Gringotts Money Exchange located in Diagon Alley. Just know that these bank notes can only be used in Harry Potter World. 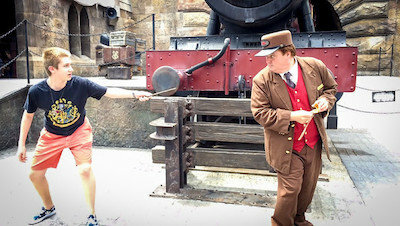 There isn’t requirement at to exchange your money at all, it is simply a novelty but for super fans and kids, a nice addition to the Potter experience. 4. GET BUTTERBEER! ALL THE BUTTERBEERS! 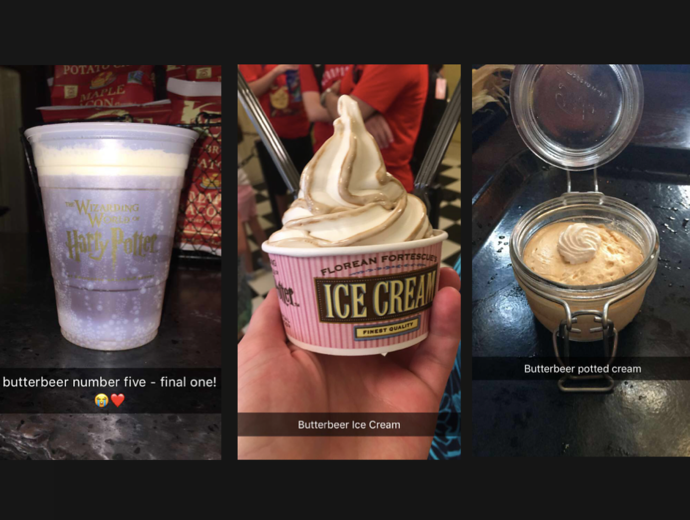 Regular butterbeer, frozen butterbeer, hot butterbeer, butterbeer potted cream, butterbeer ice cream, butterbeer fudge, OH MY DUMBLEDORE IT’S A BUTTERBEER EXTRAVAGANZA. Get it ALL. I quite like butterbeer, if you couldn’t tell. 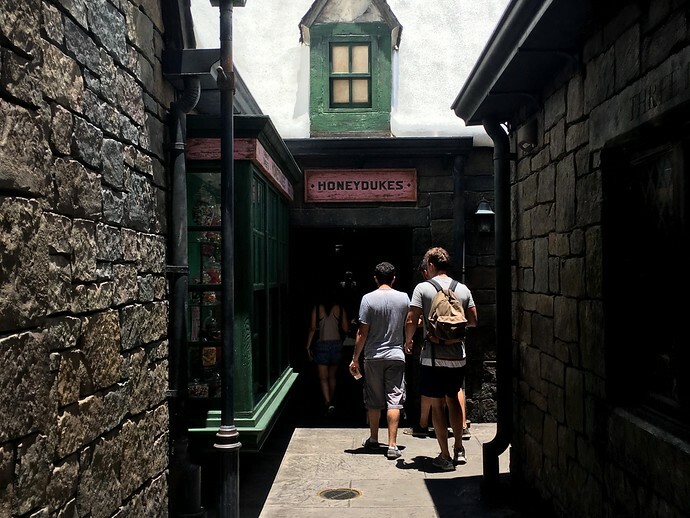 Just located near the entrance to Hogsmeade is Honeydukes Sweet Shoppe. If you walk just past it, and make a left and another left, there is a small alleyway type location. It’s quiet and makes you feel as if you really are in the Wizarding World. Stand there, breathe in the magical air, hold your wand and live your best life as the wizard you are. Also, it’s usually cool/air conditioned. You’re welcome! Thank you very much Brian for all the tips for visiting muggles! You can find more of Brian on the Harry Potter Fansite MuggleNet and he also runs an Etsy shop where you can purchase hand knit goods.